With so much choice on the high street it can be bewildering trying to work out which trends to buy in to, what colours to choose and which styles to try on. Let me be your very own personal shopper, save you money and guide you to the right brands and most flattering outfits for you. I can find the fabulous in any figure and with any budget! I will spend the first hour of the session pre-selecting specific items for you, however we can of course spend the entire session shopping together if you would prefer. 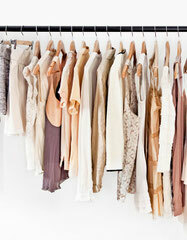 It is ideal, but certainly not essential, to have a 'Wardrobe Makeover' before a personal shopping session. I offer daytime shopping sessions on weekdays, and for a session at the weekend I charge a £30 premium. For shopping locations I cover London's West End, Westfield London, Westfield Stratford, Birmingham, Nottingham and Leicester. I am very happy, however, to shop in alternative locations convenient to you, although extra fees may apply. Have a fabulous fun day out with your best friend or partner, whilst enjoying the most efficient and effective shop possible! Format of the day is as above.